ABOUT THE BOOKOn January 28, 1945, 121 hand-selected U.S. troops slipped behind enemy lines in the Philippines. Their mission: March thirty rugged miles to rescue 513 POWs languishing in a hellish camp, among them the last survivors of the infamous Bataan Death March. A recent prison massacre by Japanese soldiers elsewhere in the Philippines made the stakes impossibly high and left little time to plan the complex operation. In Ghost Soldiers Hampton Sides vividly re-creates this daring raid, offering a minute-by-minute narration that unfolds alongside intimate portraits of the prisoners and their lives in the camp. Sides shows how the POWs banded together to survive, defying the Japanese authorities even as they endured starvation, tropical diseases, and torture. 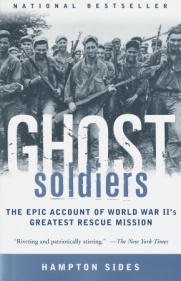 Harrowing, poignant, and inspiring, Ghost Soldiers is the mesmerizing story of a remarkable mission. It is also a testament to the human spirit, an account of enormous bravery and self-sacrifice amid the most trying conditions.